Every year Strawberry Blonde Salon participates in a number of Community and Non-profit Organization Fundraiser events. We believe strongly in supporting local fundraisers that benefit our community. We also host a number of fun events at our salon. Learn new techniques or about new products at one of our workshops. Check out the calendar below to see upcoming events. Also sign up for our new Newsletter (click here) and we'll send you an e-mail reminder about upcoming events. Another way to keep up with our community events is to visit our facebook (click here) page and "like" us to become a fan. Strawberry Blonde Salon is hosting a one-day event offering women facial fillers to address unwanted lines and creases. Nurse Rebecka DeMoss is a master in Juvederm, Radiesse facial fillers, and Botox. These services will give clients the look they had naturally when they were young. Strawberry Blonde Salon was honored to help clean-up the Gulf Coast Oil Spill. We donate our hair clippings to MatterOfTrust.org. 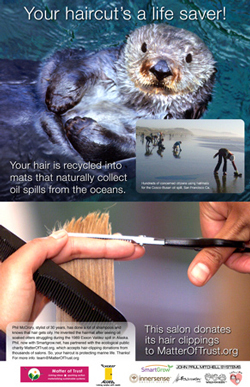 Your hair is recycled into mats that naturally collect oil spills from the ocean.